Let us do all we can to make sure we do not leave a single child behind. Let us do all we can to be sure that students have the resources and the opportunities to be remediated, coached, and/or tutored should they be behind or should they be at risk of falling behind. Let us do all we can to be sure that students have the resources and the opportunities to learn in a variety of ways so they are able to practice and improve their critical thinking and problem solving skills; so they have opportunity to practice different kinds of project-based and game-based learning; so they have opportunity to work on their reading, writing, speaking, and listening skills; so they can practice what it means to understand a problem or task and persevere; so they can see models of learning and problem solving and then experiment with their own ways of learning. Let us do all we can to be sure that non-native speakers have the same resources and opportunities as native speakers. Let us do all we can to be sure that any of our at-risk students, no matter the nature of that risk, have as many of the same opportunities as their classmates, regardless of their school, the tax-base of that school, and/or the level of parental involvement. Let us do all we can to be sure that our special needs students have the same resources and opportunities, albeit adapted for their accommodation requirements, as every other student. All well and good until reality smacks you in the face. What gets in the way? 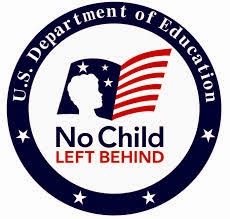 The list is long and not just the way NCLB was "implemented"--which was mostly "Here it is, now figure it out and do it with fidelity to something we can't really define and without any money. And, oh yea, there will be a test and if your kids don't do well, your pay and your tenure are probably going to be at risk." We do want accountability in our schools. We would like our teachers to be accountable for teaching and our students to be accountable for learning, and I'm pretty sure we'd like our parents to be accountable for being sufficiently involved to have regular and consistent conversations with teachers to understand what's happening with their kids and why. Does a standardized test really help? It's a data point but only one data point. I think there is some validity in having a national test against which all students are measured, but it's the students and their abilities to read comprehensively, to figure out how to tackle the problems and tasks, to manage their time, and to draw on the skills they've been learning. If kids don't have the skills and knowledge they need, is that the teacher's fault? It could be partially the teacher's fault if the teacher doesn't have sufficient content knowledge or hasn't taught or reinforced the teaching of that content or those skills. It could also be partially the student's fault for dismissing the value of that learning. I just wonder if we have placed so much emphasis on the school improvement and teachers being accountable for student learning that we have managed to convey the message students that they have little responsibility or role in being accountable for their own learning. If too many kids don't do well on a test, isn't it an oversimplification to say the problem is with the teachers? Educators are overwhelmed with initiatives and mandates. It's no wonder many of them close their doors, literally and figuratively (which in no way mean the same thing, by the way), and do what they can to get through the curriculum. Most educators I know want to be the best teacher they can be. But they are tired of people complaining about their jobs, their hours, their pay, the way they manage their classrooms, the way they teach, the way they assess. Do they know they could some things better? Yes, most of them do. This is not a simple problem so there is no simple answer. We cannot "tweak" anything. We cannot expect a single solution to work for all schools and all districts. We must figure out what we're really trying to accomplish and be as specific as possible because "improving learning" is a meaningless catchphrase. Kids are being left behind. And we have created a cacophony of mandates, initiatives, and so-called solutions so that kids won't be left behind. All we've really managed to do is overwhelm and frustrate teachers. With excessive and often conflicting mandates and initiatives, and a ridiculous number of testing requirements, we've all but ensured we're leaving our teachers behind. And if we leave our teachers behind, we can be sure we're losing our kids.